Due to space limitations, only a selection of the pulished papers are listed hereunder. OPENING SESSION. Opening address by the Minister of Housing, Spatial Planning and the Environment (M. de Boer). PART ONE:KEYNOTE ADDRESSES. Current progress in the study of global biogeochemical cycles (M.H. Unsworth and G. Wolfe). The potential effects of climate change in a riverine hydrological system in northwestern Canada (S.J. Cohen). Assessing the impacts of climate: the issue of winners and losers in a global climate change context (M.H. Glantz). Sustainable development and climate change (R.K. Turner). Global climate change: social and institutional options (M. Redclift). National and international economic instruments for climate change policy (J.B. Opschoor). Integrated models for estimating regional climate change in response to anthropogenic emissions: MAGICC and SCENGEN (T.M.L. Wigley). The process of developing policy based on global environmental risk assessment (D.J. Fisk). Communication among scientists, decision makers and society: developing policy-relevant global climate change research (J.C. Bernabo). 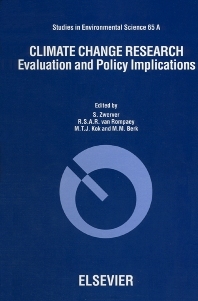 Climate change, policy options and research implications (P. Vellinga). Stabilizing Greenhouse gases: global and regional consequences (J. Alcamo et al.). PART TWO: NRP ASSESSMENT REPORTS AND SHORT PAPERS. Theme "the climate system". Assessment report on NRP subtheme "Atmospheric processes and UV-B Radiation" (R. Guicherit). Assessment report on NRP subtheme "Oceans and the climate system" (L. Otto). THEME "GREENHOUSE GASES". Assessment report on NRP theme "Greenhouse gases" (J.J.M. Berdowski et al.). THEME "IMPACTS AND CONSEQUENCES OF CLIMATE CHANGE". Assessment report on NRP subtheme "Effects of climate change on terrestrial ecosystems" (S.C. van de Geijn). Assessment report on NRP subtheme "Impact of climate change on the Wadden Sea" (W.J. Wolff). Assessment report on NRP subtheme "Impact of climate change on regional hydrology" (J. Dronkers). Assessment report on NRP subtheme "Effects of enhanced UV-B radiation" (J.C. van der Leun). THEME "SUSTAINABLE SOLUTIONS". Assessment report on NRP subtheme "Energy demand and supply options to mitigate greenhouse as emissions" (W.C. Turkenburg). Assessment report on "NRP's" subtheme "Mobility and motorised transport which fit in sustainable development" (C.A.J. Vlek). Assessment report on NRP subtheme "Culture, consumption and lifestyles (C.A.J. Vlek). Assessment report on NRP subtheme "National instruments for climate change policy" (H. Verbruggen). THEME "INTEGRATION OF CLIMATE CHANGE RESEARCH".. Assessment report on NRP subtheme "Risk analysis" (W. Biesiot and L. Hendrickx). This book will be of value to anyone professionally interested in the various aspects of climate change research and policy.